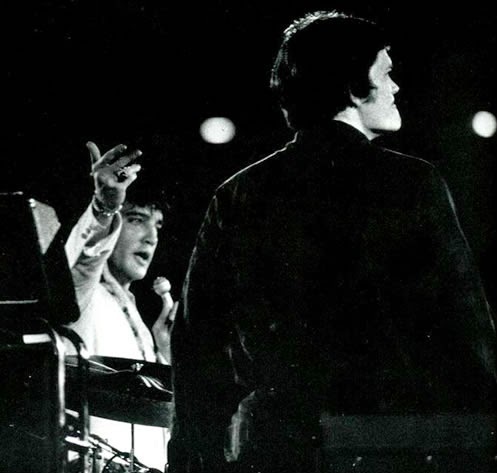 Elvis introducing drummer Bob Lanning at the Houston Astrodome, February 1970. Yesterday, on August 16 no less, the website elvisnews.com announced that drummer Bob Lanning will be a part of the 2015 edition of ‘An Evening with Elvis’ Friends and Original Musicians’ tour (which also includes among others bass player Duke Bardwell). As you might know, Bob Lanning replaced Ronnie Tutt during Elvis´ second Las Vegas engagement in January-February 1970. The then 22-year old drummer also played with Elvis at the Houston Astrodome during six concerts following the shows in Vegas. It’s Bob Lanning that you can hear on classic Presley recordings like ‘The Wonder of You’, ‘Polk Salad Annie’ and ‘Walk A Mile In My Shoes’, and on albums like ‘On Stage – February 1970’, FTD releases like ‘Polk Salad Annie’ and ‘The On Stage Season’, as well as imports like the ‘Rebooked At The International’ box-set. After reading this exciting news, I decided to ask the producer of the tour, Arjan Deelen, some questions about Bob Lannings participation in the show, and I didn’t have to wait long before he answered my mail. How did you come up with the idea to get Bob Lanning on the show? Arjan Deelen: I have always been fascinated by Bob Lanning. I mean, he did these 63 shows with Elvis, played the hell out of those drums, and then he completely vanished, almost Houdini-like! There was no information about Bob or his whereabouts at all… just bizarre. Various researchers have tried to locate him over the years, but none succeeded. I like a good challenge, so a few years ago I started my quest to find him. I believe that the discovery of Bob Lanning and him agreeing to do the tour in May 2015 is one of the coolest news stories in the Elvis scene at present. Remember, he played the drums during a very important Las Vegas engagement, where Elvis successfully made the transformation from an oldies act to a contemporary artist with many cool new songs, both his own fresh hits and interesting covers. And of course Lanning also played on those six amazing shows at the Houston Astrodome. Those shows are also important from a historical perspective. Arjan Deelen: I don’t want to toot my own horn, but I’m a persistent guy. Just ask my wife! When doing research, or in this case you could call it a plain manhunt, it’s important that you stay focused, also when you run into obstacles. Over the years I have found and brought over various people who played an interesting part in the Elvis story: Duke Bardwell, Mary and Ginger Holladay, Carol Montgomery, Michael Jarrett, etc. Without me, European audiences would have never seen these people on a stage or heard their stories. Sad but true. Most fan clubs play it safe and bring the same people over, year in, year out. Personally I find it interesting to track these people down that also contributed to Elvis’ music in a significant way, and it gives me a great deal of satisfaction to let them have their moment in the sun, so to speak. They deserve it. How did he react when you asked him to join the tour? Arjan Deelen: I think that initially he was a bit cautious. Like me, he is not too impressed with the impersonators, or the European singers that are often used for shows of this nature. But when we discussed the show in detail, and my philosophy about the show, it seems that he got really excited. Then I sent him some clips from this year’s show, and that sort of sealed the deal. He loved the fact that we did songs like ‘Long Black Limousine’ and ‘Anyway You Want Me’. I mean, what other Elvis show is doing songs like this? I think he sensed that this was done with integrity and great respect for Elvis, so he gave me a very firm YES when I asked him. What has he been doing since playing for Elvis in 1970? Arjan Deelen: In recent years, he has lived a quiet life. He lives in a beautiful area, loves nature and enjoys bicycling every day for two hours. He also drums for about two hours every day, for the fun of it mostly. He says he has never been tempted to participate in an Elvis tribute show, in fact, he has never even done an interview about him. But you can read his story in the December issue of “Elvis – The Man And His Music”, the best Elvis magazine around. You can order it here. What are his recollections of playing with Elvis? Arjan Deelen: He has nothing but fond memories of his time with Elvis. He remembers Elvis as a kind, fun loving guy who was also a tremendous singer and a great showman. Of course, Bob played with him during that brief period where Elvis was on top of the world. He was excited about his comeback, thrilled to be performing again in front of live audiences, he was just feeling good about life. You can hear it in the recordings that were made. ‘On Stage – February 1970’ is definitely one of his best live albums, perhaps his best. These recordings just ooze excitement and joy… ‘Polk Salad Annie’, ‘The Wonder Of You’, ‘Long Tall Sally’, ‘Walk A Mile In My Shoes’… It doesn’t get better than that. Some people still think that it’s Ronnie on those recordings, but no, it’s Bob Lanning. If you listen closely, it’s quite obvious. Ronnie is perhaps a more elaborate and nuanced drummer, while Bob is a no-nonsense rock drummer with a harder and groovier sound. Just compare ‘Polk Salad Annie’ from February and August of that year… BIG difference. What do you think his contribution will mean to ‘An Evening with Elvis’ Friends and Original Musicians’ when it tours Europe next year? Arjan Deelen: Oh, the whole show will be rejuvenated. Bob is in great shape, and he is really excited about this. I think his excitement and great playing will inspire the band, and I think we are going to see some great shows. Plus, for audiences it’s going to be a real thrill to finally see and hear the drummer who originally played on songs like ‘The Wonder Of You’ and ‘Polk Salad Annie’ perform these songs for the first time since 1970! If that’s not a real scoop, then I don’t know what is. This is going to be a LOT of fun! I really appreciate you taking the time to answer these questions Arjan! Arjan Deelen: Thank you, Thomas, I enjoyed it!